Senate candidate Terri Lynn Land’s claim that she is a small business owner, not part of the lucrative Land & Co. real estate conglomerate run by her husband, clashes with five Grand Rapids city inspectors’ reports from 2011-12 obtained by The Macomb Daily. Each of the documents indicates the Southview Apartments complex that Land claims she owns and operates is, in fact, in the hands of the “registered owner” — her husband, Dan Hibma, and Land & Co. That contradicts Land’s narrative in recent weeks that she has no ties to the family business and should not be portrayed as one of the wealthiest Senate candidates in the nation. 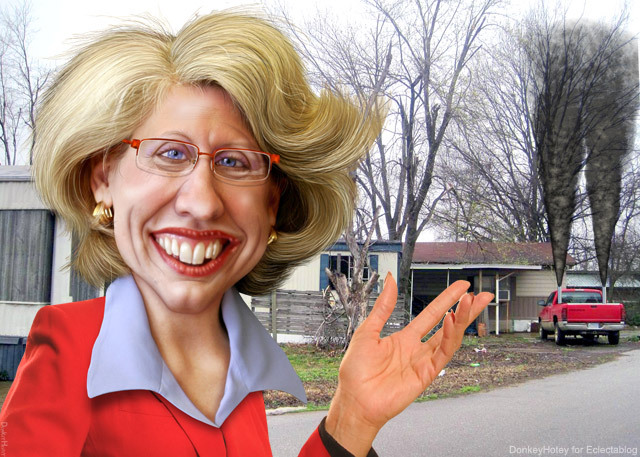 In her Senate race as the Republican nominee facing off with Democratic U.S. Rep. Gary Peters, Land has tried to distance herself from Land & Co., especially the firm’s decision to close down and demolish the Grand Rapids area mobile home park run by the Land family, including Terri Lynn….Land, who initially featured her role at the quaint trailer park as a young woman, insisted she played no prominent role in the family business once the full story became known. At some point, all of these lies are going to catch with the Koch brothers candidate and voters are NOT going to elect an unqualified liar to the U.S. Senate. Meanwhile, a complaint filed by the Michigan Democratic Party with Michigan Secretary of State Ruth Johnson goes uninvestigated. However, Johnson, a Republican, jumped right on a frivolous complaint filed by the Michigan Republican Party that erroneously claims Democratic Lt. Governor candidate Lisa Brown has violated election laws by failing to form a campaign committee. The two complaints were filed just three days apart yet Johnson has yet to launch an investigation into Land’s violations and lies. It’s pure politics when the Republican Secretary of State will pick up a frivolous and meritless complaint but won’t investigate one of their own in Terri Lynn Land for potentially lying about her business experience. As a former Secretary of State, Land enforced campaign finance laws but she still thinks she doesn’t have to play by the same rules as everyone else. The Secretary of State only seems invested in Republican party unity rather than holding all candidates accountable to the law. Michiganders deserve the truth about Terri Lynn Land’s secretive finances and business experience.